When you write a message in Outlook, do you just click the New Message button, type your note and press Send? Have you ever clicked the "Options" button? With Outlook connecting to an Exchange server, you have a number of options available to you allowing you to change how your message is handled. These settings apply to the message you opened options from. Some options can be set for all messages. Use Tools, Options in the main Outlook screen to set these. The screenshot below shows you what is available to change. Sensitivity: Personal, Private, Confidential and Normal - the recipient sees a message at the top of the message screen along the lines of "Please treat this message as Private"
Use Voting Options: Allows you to send a message with predefined buttons. "Approve/Reject", "Yes/No" and "Yes/No/Maybe". Request a delivery receipt for this message: This sends a message back to you when a message is delivered to their mailbox. Request a read receipt for this message: This sends a message back to you when a message is read. Note - most email clients are configured to prompt the reader if they want to send the receipt. Many people don't. With external messages this may not always get a response as some servers don't support these features or they are blocked by the server admin. Probably the most useful section. Have replies sent to: This allows you to send an email out and have replies sent to another person within the Exchange address book. This could be a PA or admin person or a special email box to collect replies. 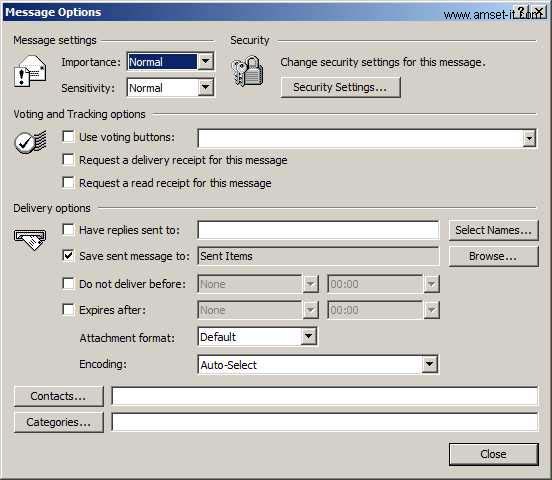 Save sent message to: Not normally changed, but you could change the location a copy of the sent message is saved to or disable the feature (so sent emails are not stored). Do not deliver before: Allows you to set a time and date for a message to be sent. Useful for reminders etc. Expires After: Allows you to set a date which the email message expires. The message will have a line through it when it expires. Useful if the message could cause confusion after a certain date. Used by IT people a lot to notify about downtime. Attachment Format: and Encoding: If you are sending to someone externally and they are using another email client, you can change how any attachments are encoded so that they can receive them. These area can be left alone unless you know that you need to change them.